AT 23-years-old carriage driving stallion, Paddy had started to look his age and owner, Sam Kelly was looking at retiring her much loved liver chestnut. Known as Stapleford Enchantment in the show ring, Sam has owned Paddy since he was a weaned foal, and driving is very much a family affair with everyone enjoying the sport. Last year Paddy had started to lose topline and general condition and wanting to do the best for her beloved partner, Sam looked around at what feeds would be suitable to help. Sam started to feed Paddy, Equerry Conditioning Mash last year and he never looked back, with the family deciding to put his retirement on hold, he is now looking so well. Said Sam: “We are delighted with the results, Paddy looks fantastic and is worked five times a week which is why it is essential he gets the correct feed and his energy levels are sufficient. “He is such a versatile horse and Paddy has competed in in hand, driven and ridden showing, horse driving trials and ridden dressage. He has even taken our daughter to her wedding. “As a family we just really enjoy driving. I take on the role of backstepper as well as groom and lorry driver. 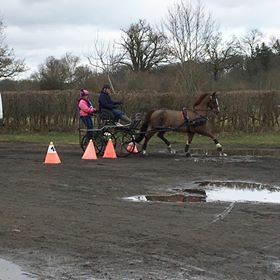 I’m a bit of a jack of all trades and we won five out of five competitions this season and are very much looking forward to the Indoor Driving Championships at Keysoe which we have qualified for. “We have been delighted with Equerry Conditioning Mash, it has definitely restored Paddy’s topline and worked wonders for his general health and wellbeing, and his coat now really shines. Equerry Conditioning Mash is a quick-soaking mash for horses that need to gain weight and condition. It is low in sugar and starch and is ‘Non-Heating’ and includes highly digestible fibre sources including sugar beet. It has a good level of protein for muscle development and topline and the high oil level and linseed in the feed helps promote condition and a shiny coat. The mash also includes a high level of yeast for a healthy digestive system and has added vitamins and minerals including magnesium.